Portable sensor measurement on your phone. Slim, flexible pressure sensors and cables available with app release for applications in Lymphedema treatment. Compatibility with temperature, chemical, position, and all other resistive sensors. Rapidly calibrate to any resistive sensor and application. Start recording instantly and build calibration profiles as you go. Graph live sensor output and export data for analysis or playback. RMS Harnesses your built-in audio hardware to power sensors. 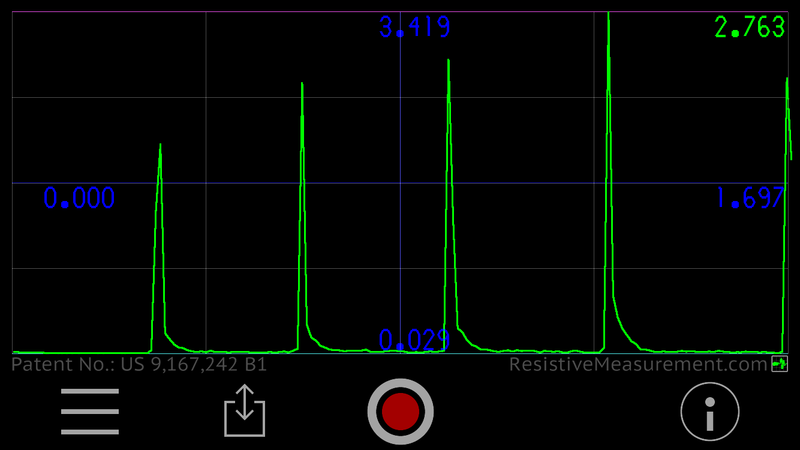 As the audio wave passes through the sensor it is attenuated and the app measures the modified amplitude. Your phone or tablet displays, saves and records measurements from your resistive sensor. Thank you for your interest! We will notify you of releases and discounts. The versatile app is compatible with any resistive sensor you connect. Connect sensors to your device audio port. Thin, flexible sensor detects even light pressure for use in Manual Lymph Drainage and Compression Garment quality control. We developed Resistive Measurements System for applications in Lymphedema treatment including MLD and Garment pressure testing. We are excited to offer a versatile platform ready for user in education, industry, or anywhere else.